Clusters of green to white or tan wart-like bumps or lesions were recently observed among veins and petioles of black-eyed Susan vine liners. 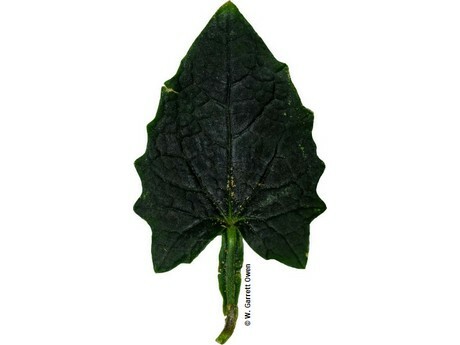 These abnormalities growing on the leaf and petiole surfaces is a physiological disorder, intumescence. During a recent greenhouse visit, liners or rooted cuttings of black-eyed Susan vines (Thunbergia alata) were inspected. 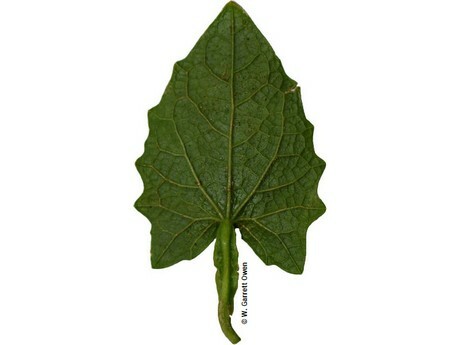 Upon closer inspection, matured leaves were exhibiting abnormal growths on the adaxial (upper; Fig. 1) and abaxial (lower; Fig. 2) leaf surfaces. The growths ranged from sporadic green to white bumps or lesions to tan outgrowths (Fig. 3). Figure 1. 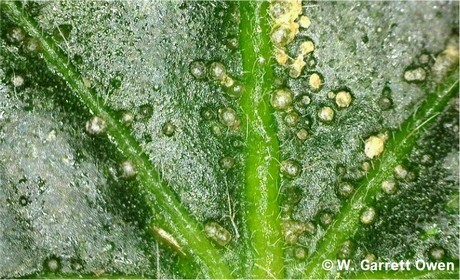 Adaxial or upper leaf surface of mature black-eyed Susan vine (Thunbergia alata) leaves exhibiting abnormal outgrowths. Photo by: W. Garrett Owen. Figure 2. 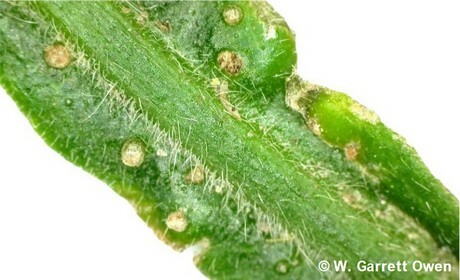 Abaxial or lower leaf surface of mature black-eyed Susan vine (Thunbergia alata) leaves exhibiting abnormal outgrowths. Photo by: W. Garrett Owen. Figure 3. Abnormal growth of mature black-eyed Susan vine (Thunbergia alata) leaves included sporadic green to white bumps and tan outgrowths. Photo by: W. Garrett Owen. The green bumps and tan outgrowth were found between the veins (Fig. 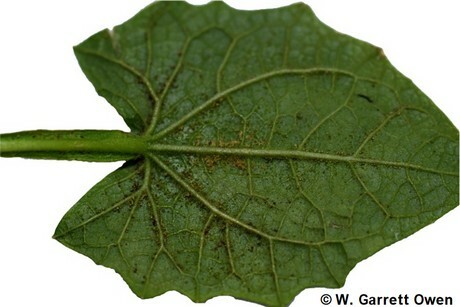 4) of the leaf and along the mid-rib to leaf base (Fig. 5). Though the bumps and outgrowth were intermittent, I noticed some leaves to exhibit small green or white bumps, while others, the bumps were enlarged and protrude out from the leaf surface, turning tan and hardening. While the majority of the abnormal outgrowth occurred on the upper leaf surface, I did find some growth arising from “winged” leaf petiole (Fig. 6). In some instances, no bumps or outgrowths were present (Fig. 7). The abnormal growth is a physiological disorder termed, intumescence, however other common and interchangeable names include: excrescences, neoplasms, galls, genetic tumors, lesions, enations, and oedemata. Figure 4. Green bumps and tan outgrowth found between the leaf veins of mature black-eyed Susan vine (Thunbergia alata) leaves. Photo by: W. Garrett Owen. Figure 5. Green bumps and tan outgrowth were found along the mid-rib to leaf base of mature black-eyed Susan vine (Thunbergia alata) leaves. Photos by: W. Garrett Owen. 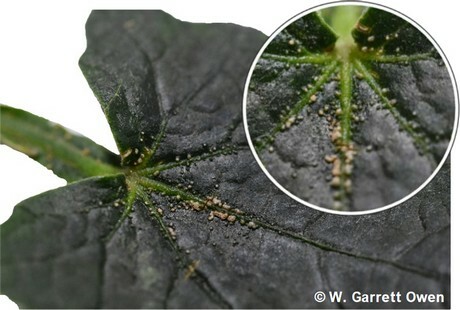 Intumescence development on leaves and petioles can have an impact on the aesthetic value of ornamental crops. The causative factor(s) related to intumescence development is rather vague. Many have proposed intumescence development to be a result of air contamination, carbohydrate balance, chemical application, excess water, genetics, hormones and hormone concentration, humidity, light quality and quantity (intensity), and temperature. To date, there is no cure for intumescence development. Other crops that intumescence are often reported to occur on but not limited to include cleome (Cleome hassleriana; Fig. 8), cuphea (Cuphea sp. 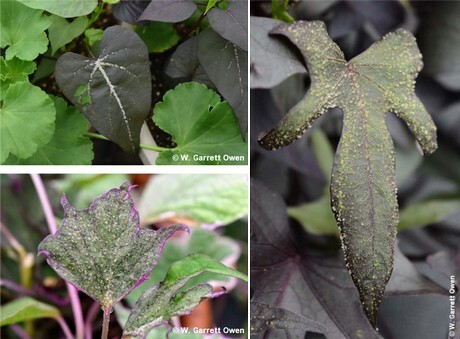 ), ivy geraniums (Pelargonium peltatum), ornamental sweetpotatovine (Ipomoea batatas; Fig. 9), tomatoes (Solanumlycopersicum), peppers (Capsicumsp. ), and kale (Brassica oleracea). Figure 7. Example of mature black-eyed Susan vine (Thunbergia alata) leaves without bumps or outgrowths. 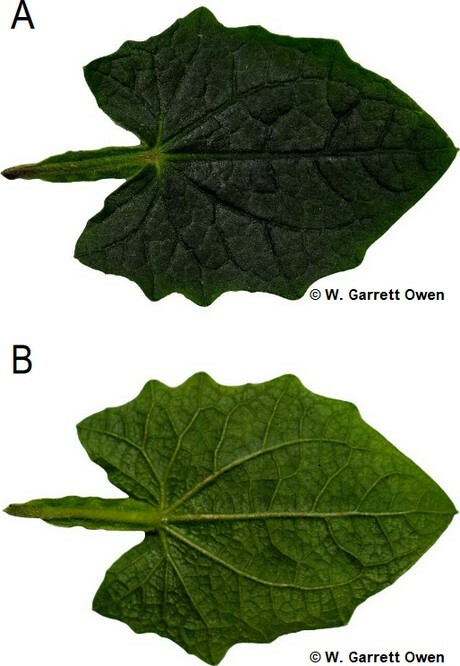 (A) Adaxial or upper and (B) abaxial or lower leaf surfaces. Photos by: W. Garrett Owen. Figure 8. Mature leaves of cleome (Cleome hassleriana) exhibiting abnormal white outgrowths on the upper leaf surface. Photos by: W. Garrett Owen.